papa today went to play his dirt bike.. left mummy & marcus only at home.. so mummy decided to blog what we did together today!!! 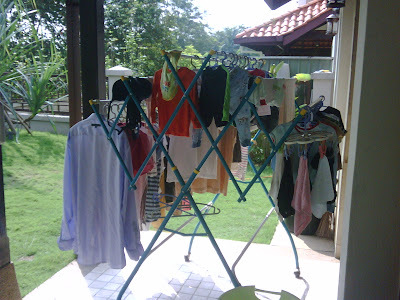 10.30am - The laundry is done!! mummy put me on my stroller.. and I watch mummy hang the wet clothes to dry... 10.50am - mummy washing again the dirty plates and bowls.. in the mean while mummy on the TV for marcus to watch "your baby can read" he half watching half playing.. then.. mummy sweeping the floor.. "damn it!!! - marcus fall down while trying to walk from coffee table to the arm chair" crying and crying.. mummy pat pat and comfort Marcus.. 11.20am - marcus want "ng ng".. mama put him on his potty and he try to poo poo.. but he already half did in his diaper.. mama wash Marcus's buttock and change to a clean diaper..
11.30am - marcus seem tired.. need his morning nap.. mummy bring him upstairs and put him to sleep.. after 15 minutes of swinging up and down.. he finally goes to sleep soundly..
12.05pm - mummy went and heat up the porridge which mummy cooked yesterday night... cut and blend a fresh pear fruit for Marcus lunch later..
12.30pm - mummy typing the blog.. browse internet.. look at facebook..
1.15pm - marcus wake up from his 45min nap... and mummy feed marcus his yummy lunch.. and he finished all.. what a good boy!! 2pm - mummy is hungry.. mummy get changed.. then baby also get changed.. we going out to carrefour do some grocery shopping and mummy can go to have her lunch.. 3.15pm - reached home from shopping and keep all the things inside the fridge and cabinet..
3.30pm - washing plates and bowl (lunch time one) again!!! 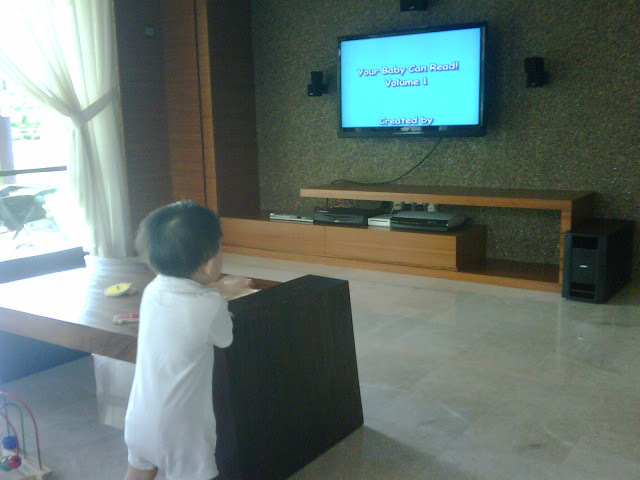 3.45pm - on the newly bought Tom and Jerry for Marcus to watch.. but he got no interest at all.. playing climbing up and down from the chair and sofa for thousand times.. he is not tired but I am..
4.50pm - bring Marcus downstair.. try to mixed milo into 2 oz of the left over milk just now in the straw cup.. playing and keep let him to sip by sip to drink it.. he drank the 2oz but take around 20minutes.. "really need patient!!!" 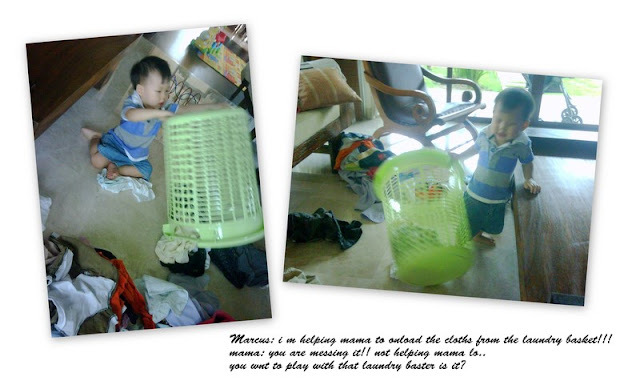 then feed marcus some snack.. "yogurt"..
5.30pm - went out to the house yard.. feed the fishes.. then keep the clothes which washed in the morning.. then lipat baju.. marcus playing helping mama lipat baju.. 6.00pm - came upstairs.. mama con't typing this blog.. marcus playing on the floor..
6.15pm - Marcus bath time aGAIN.. 6.30pm - papa came back lor... mama went reheat the porridge.. put in some fish.. add some milk.. made orange juice.. packed some biscuits..
7.00pm - mummy's turn to bath loh..
7.15pm - we went out for dinner.. marcus very good boy finished all the porridge and fruits mummy bring out.. and he eat little bit of rice too.. and he walking walking around the restaurant by holding on to mummy's hand or papa's hand.. 9.00pm - back home.. papa read magazine.. mama busying washing the bowl and plates again!! then play with marcus the "tool box" papa bought at ikea last weekend..
9.30pm - bring marcus upstairs.. change mamypoko diaper.. change into pajamas..
9.40pm - mummy singing "twinkle twinkle little star", "主祷文", then pray.. while swinging marcus to sleep..
10.30pm - finally.. mummy can have some personal time.. and now cont typing this blog.. worry tomorrow will forgot about the details and time..
cont on 4 Jan 2011.. inserting the picture during lunch hour.. 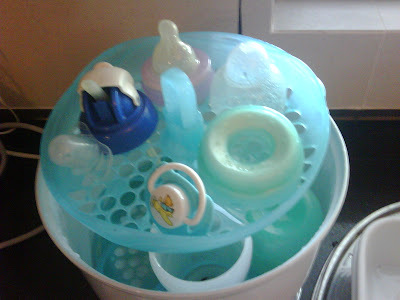 It is really NOT easy to be a SAHM (stay-at-home-mum)!! Or some people like to called SAHM as 黄脸婆... which I think it is so unfair.. where to find time to make ourself look better when we are busying taking care an active toddler / baby??? Hmmm... 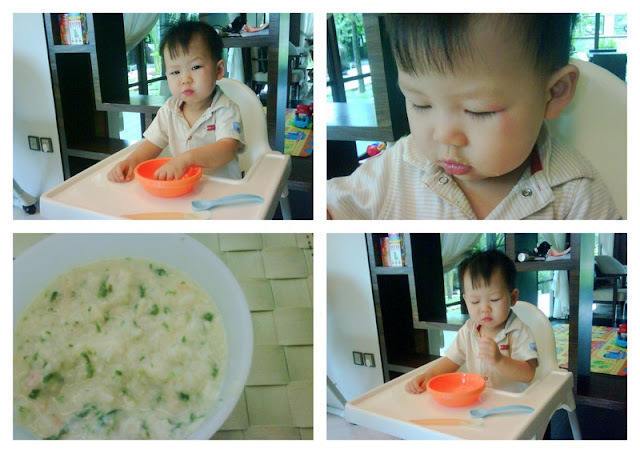 Very detailed life with Marcus~ And Marcus still only drink milk when he fall asleep?